Our fiscal year, which started July 1, 2016, began with a proposal to raise and appropriate $162,350 to continue full day kindergarten given state grant money was not received as expected. The committee approved unanimously a motion to recommend passage to the Town Council. 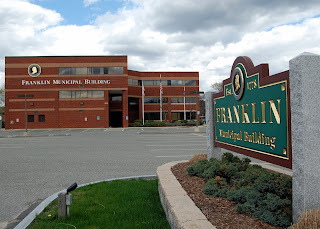 We also were informed by the Town Treasurer the “Municipal Modernization Bill” was passed and will have a positive impact on various operations within the town. During the year the committee met 8 times. Three of those meetings were focused on the Fiscal 2018 budget process, with the end result being the approval of a projected $120.5 million operating budget for the town. The budget allows for the town to provide services at the same level as FY 2017. The long term financial plan projected continues to project financial challenges over the next 5 years. While our town continues to provide excellent services with little increase in resources, our reserve levels continue to be challenging. A concerning indicator is shown in the Franklin Public Schools need to draw on their reserves at an unsustainable pace. Housing units are projected to grow and the impact on the school budget is currently unknown and will need to be monitored on a regular basis. The town continued our prudent practice of reserving funds to our OPEB Trust Fund, Fire Truck and Recreational Fields Stabilization funds. Our town continues to invest in our public spaces, appropriating $0.5 million for general road and sidewalk maintenance. Additionally, snow removal exceeded the budget by $85K and the committee voted unanimously to fund the deficit from Free Cash. I’d like to take the opportunity to thank my fellow committee members for their ongoing dedication to continued improvements and the financial well being of our town.